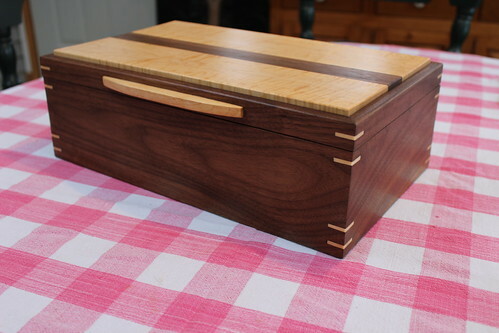 Just finished the third of three large jewelry boxes, which have occupied most of my summer and fall, off and on. Also included here is a tiny little box that took only a day to construct (but then some time on the finishing and flocking). The large box is finished just in time to qualify for free shipping to the client (my wife is driving down to the city next week). As always, click any photo to view larger on Flickr. 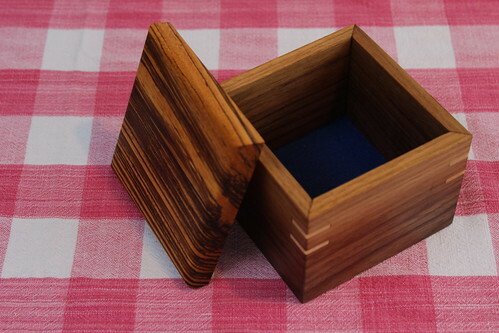 A tiny bit larger than the last two large jewelry boxes in this series, this one measures about 9″ x 15″ and about 5″ tall. 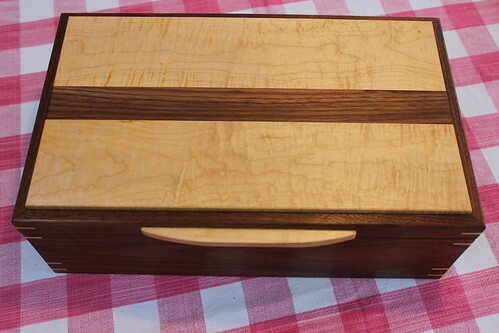 Two pieces of bookmatched quilted maple, divided by a walnut strip, make a simple lid design that lets the wood do the talking. 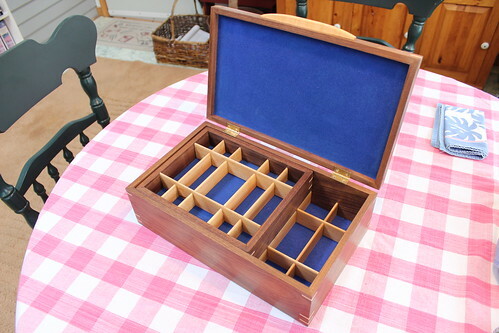 Lots of scope with this large box containing 30 separate compartments of various sizes. The blue flocking sets it off nicely. Shown here with the upper tray removed. About 4 1/2″ square by 4″ tall, with the lid. 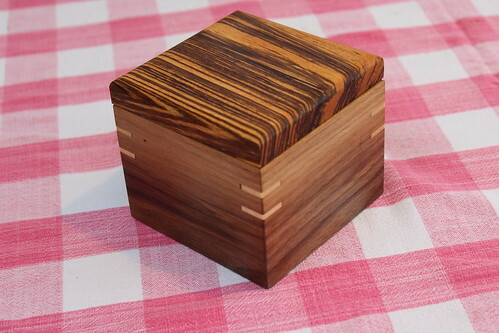 From a test piece I cut while building the larger box, I thought this would make a sweet little box of its own. Zebrawood lid is just rabbeted to fit, shown here removed to display the blue flocking inside. All of my recent boxes have employed mitred corners with mitre keys for style and more importantly to improve the glue bond at the corners. Other similar construction techniques were used on all of them, like the way the lids are made, and the way the hinges are attached. Think I need to shake things up for the new year, but not sure how yet. Thanks for looking! And remember, click any photo to view larger on Flickr. 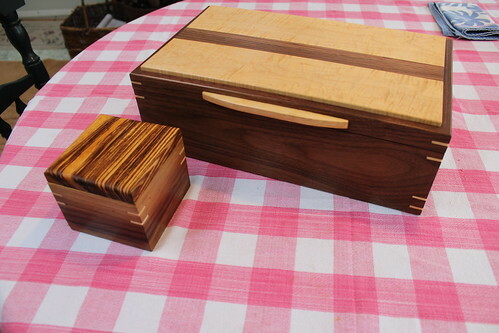 This entry was posted in Woodworking on December 30, 2011 by admin. Found your website completely by accident. Do you mind if I ask do you make these products to sell? If so, what is the proceedure for obtain one? 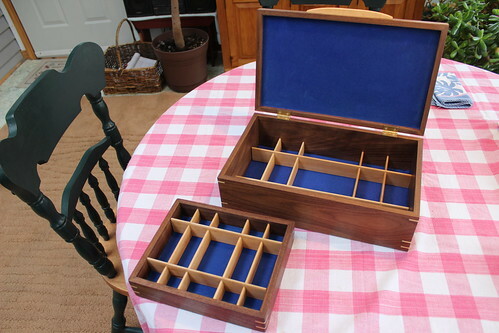 Approximate cost for a jewelry box such as this?